As a passenger in a microlight (C42 Icarus) I took control and flew it for about 20 mins. A marvelous feeling. It reminded me of the last time I ‘had a go’. I was 17 in 1959 and a member of 1600 Sqn ATC. This was St .Philips Grammar School Squadron at Edgbaston Birmingham. Whilst there were official initiative tests we sometimes invented our own and would go off hitch hiking to an airfield to cadge a flight. Thus my good school friend Denis Lyons (now sadly deceased) and I found our way to RAF Abingdon. As usual the COs were keen to encourage cadets and it didn't take much doing to get a flight. How impressive was that ! Whilst I cannot remember some of the detail ( like how we actually got aboard ?) there are outstanding things that stick in your mind for ever. Out to the Beverley - “Right lads get in there - right in the nose (parachute aiming ?) a few circuits and bumps and then we'll give you a tour.” Whilst I cannot remember if we both squeezed in at once but by golly I can well remember seeing that runway getting very very close. A touch down, sudden deceleration and then open up again and off. Really impressive. After two or three circuits off and away. Gain some height and our ‘tour guide’ appeared. He took us up to the tail boom to show the seating arrangements and then back to the main hold. We were flying without the rear doors and there was simply a large webbing strap net across the rear. Sadly I cannot remember who or what rank our guide was but he took us up to within about 6-10 feet of the edge and said, “watch this”. He took a 2” wide web strap, rolled into a coil and threw it straight out the middle. It went some way out along the tail boom and promptly returned. He said, “don't get to near because you won’t come back in”, but let us both try to throw out the strap. He then took the strap and threw it sideways where it disappeared into the slipstream and was gone. I often wondered if some one suddenly found 10’ of strap hitting them. Now we climbed above the clouds and were taken up to the cockpit. There the pilot motioned to the unoccupied seat and friend Denis took the controls for a while. He had flown in Chipmunks before and knew a little of what he was doing. Then came my turn - what an experience. I had never touched the controls of an aircraft before, not even link trainer. I sat there carefully tickling, left, right to keep the wings level to the turn and bank. Meanwhile friend Denis standing by my shoulder was attracting my attention without trying to make it obvious and pointing to the instruments. I suddenly noticed the one that said Altimeter was going quite rapidly round in a downward direction and the pilot was looking slightly anxious. I gently pulled back the stick and noticed the sound of the engines come under load. It was shortly after the pilot took control again. Whatever, it was a wonderful and never to be forgotten experience. In the 3 years I was in the ATC I missed out and never did get to fly in a single engine aircraft or a glider. I was always next in the queue but what a great time we all had.Even when on a similar escapade to Hawarden in Oct 1958, of three of us I drew the lot to fly in a Vampire but it had to leave early. 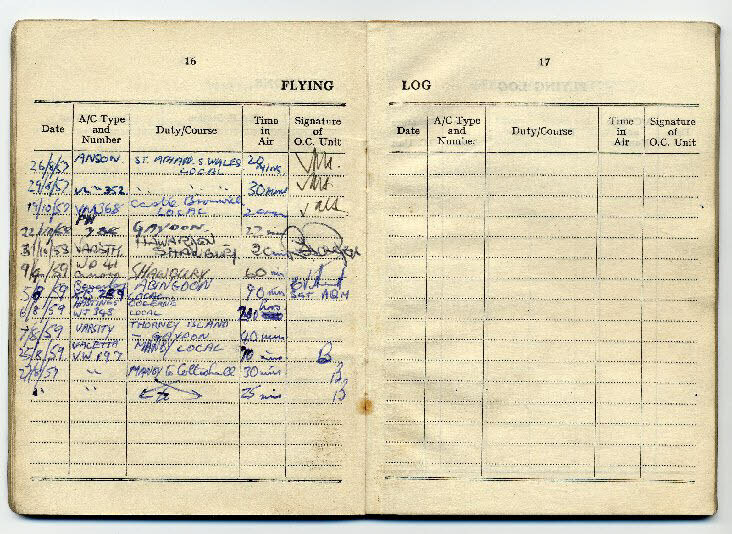 However upon his return ( I think it was a Squadron Leader Page ? ) he picked up a phone, said, “get the Varsity out”, and flew the three of us to Shawbury. “Should we strap ourselves in Sir ?. “Good Lord no”, said he, “ we're only going to Shawbury, and took off in a very tight bank with the three of us standing just behind him. Yes those were the days, those are the memories and that Blackburn Beverley !!!!!!!!!!!! ------------ How could the RAF destroy that one. So finally would there be any record anywhere of the final fate of XB289. I must make my way to Fort Paull. XB289 first flew on 21st August 1956. It went to 53 Sqn, coded as ‘V’. It was damaged when a 1-Ton Container drop went a bit wrong, causing some damage to the rear fuselage. It was repaired at Abingdon. When 53 Sqn was disbanded, XB289 went to 47 Sqn. In April 1964, it was transferred to 34 Sqn in Singapore coded as ‘289’. It was scrapped at Seletar in 1968.